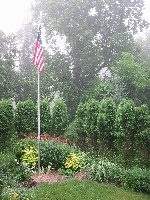 20' Aluminum Flagpole. Rust free white powdercoated aluminum shaft sections.2" diameter. Comes complete with gold anodized ball,cast alumnium truck,aluminum cleat, black PVC ground sleeve. 3'x5' nylon US flag included.